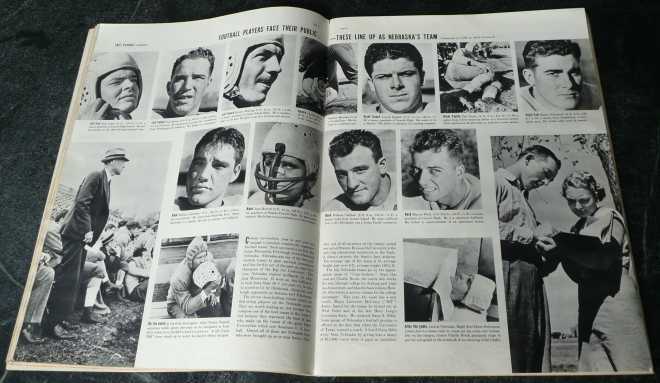 1937: Nebraska football gets prominent play, including this two-page spread, in the Nov. 1 issue of Life magazine. There are fan shots from the game at Iowa State and this Bill Callihan tackle from the big upset over Minnesota. All but the Callihan photo were shot by the legendary Alfred Eisenstaedt. «1892: After Nebraska's 18-4 loss to the Denver Athletic Club, the Lincoln Evening News pokes some fun at the sport. 1897: Nebraska has its way with Missouri, 41-0, in Lincoln. 1932: A fourth-quarter interception by Bernie Masterson sets up Hubert Boswell's touchdown run in Nebraska's 6-0 win against Kansas State. | LJS: 1, 2 | DN | Stats | Also, legendary Nebraska tackle John Westover looks back on the exploits of the turn-of-the-century Cornhuskers. «1962: In a bruising defensive battle, Missouri hands Bob Devaney's first Nebraska team its first loss, 16-7. The Nov. 3 game marked the beginning of the home sellout streak that continues today. 1972: The Huskers shut out their fourth consecutive opponent, Oklahoma State, giving No. 3 Nebraska a 332-34 point differential over its opponents after seven games. 1987: Nebraska ties a school record with five TD passes in a 42-7 win at Missouri. 1997: Coach Tom Osborne collects win No. 250 in a 69-7 romp over Oklahoma. 2002: A late interception allows Texas to dodge an upset in Lincoln, 27-24. 2007: NU gives up 11 TDs in a 76-39 loss at Kansas. In Lincoln, Paul Meyers returns to the Athletic Department. 2012: Jamal Turner's 5-yard reception from Taylor Martinez with six seconds remaining caps Nebraska's 28-24 win at Michigan State. Martinez had 205 yards rushing, including a touchdown runs of 71 and 35 yards.